Admittedly, things have been a bit quiet on the blog lately. Not very many posts on Vandalog, and you may be wondering what’s up, but we’ve been staying busy on a few major projects behind the scenes. This week, we’re excited to share to share one of those projects with you: Art in Ad Places (AiAP), an entire year of ad takeovers in NYC. 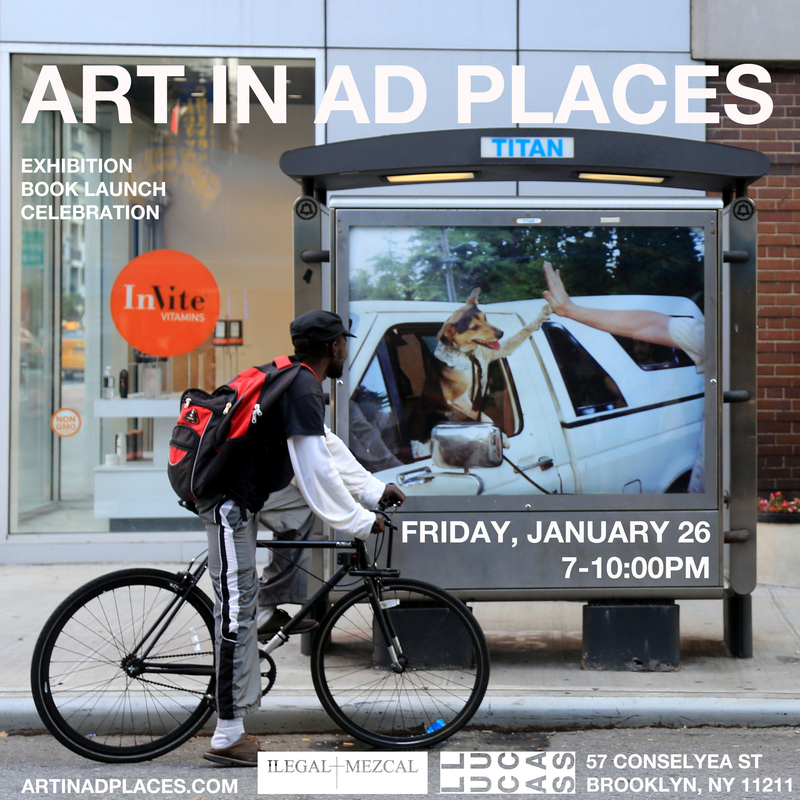 Co-curated by Vandalog contributor Caroline Caldwell and I, AiAP is a 52-week public art campaign replacing NYC advertisements with artwork. AiAP launched on Thursday with artwork by Adam Wallacavage and an article on Hyperallergic. 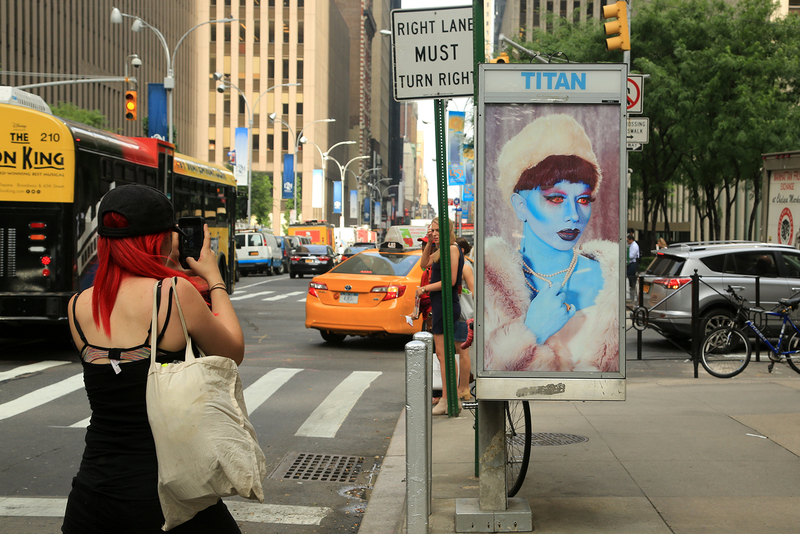 Every week, starting this week and continuing for a full year, the AiAP team will install a new artwork by a different artist at a payphone in New York City. 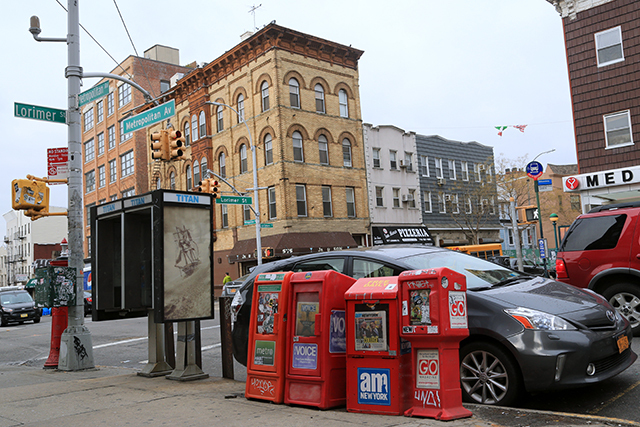 AiAP is an active and artistic response to the unending proliferation of outdoor advertising in New York City and elsewhere. AiAP was inspired by a specific instance of an especially body-shaming billboard that we walked by almost every day this past spring, a general dislike of outdoor advertising (consuming advertising is unhealthy, and with outdoor advertising, there’s no way to opt-out, except to remove it), and a desire to see a different kind of ad-takeover campaign. Rather than putting up a lot of ads in one day, AiAP will be sustained over a year, one artist at a time, with each artist giving their reason for participating. We kicked off AiAP with an installation by Adam Wallacavage. 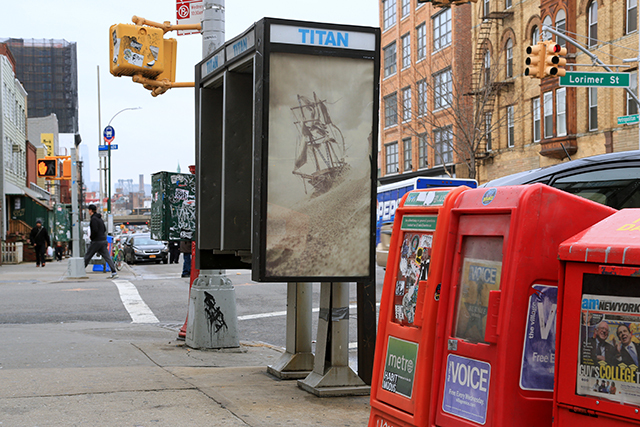 The poster, part of Wallacavage’s Shipwrecks of Unicorn Beach series, can be found in Williamsburg, Brooklyn. Further AiAP installations will come from artists from all over the country and who work in a variety of mediums. Artists will be announced each week on Instagram as their posters are installed, with the full line up only being revealed at the culmination of the exhibition. To keep up to date with AiAP and learn more, check the website, follow the campaign on Instagram and Facebook, and sign up for the AiAP email list. Adam Clark’s Billboard Bandits: Outlaw Artists in the Sky, published this year, is 208 pages of photos, entry level information on graffiti culture (i.e. What are throw-ups, pieces, and billboard backs? ), profiles and personal anecdotes in the vernacular of true writers (which includes explicit language). 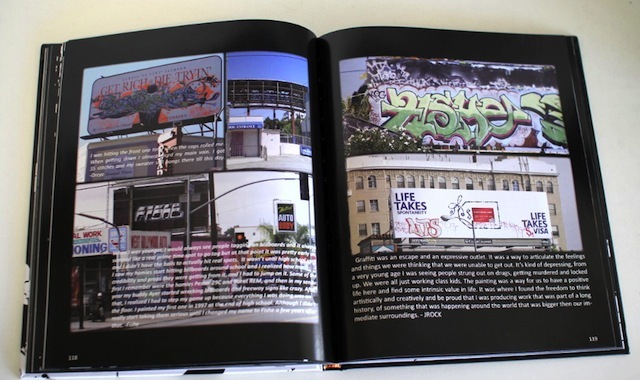 The book is divided into two sections by graffiti and street art, with “Billboard bombing” representing the graffiti camp of billboard interference, which seems to be a bit looser in definition given that many of the pieces were not on the ads directly, but above, below, on the walls behind, or on the backs of billboards. The street art portion, entitled “Billboard Liberation”, is a lot more limited in coverage but profiles some street art favorites like Ron English and Billboard Liberation Front. Clark’s distinction between the two subcultures is a necessary one for this topic since the motivation behind hitting billboards is entirely different: graffiti artists use billboards as a highly-visible platforms to proliferate their names, whereas street artists tend to utilize the space to express ideas. The common thread between both is the drive to deemphasize, interfere with, or eliminate the ubiquitous power of adverts. The content is fit for a niche audience of LA graffiti heads, with featured West Coast writers such as AM7 Crew, Augor MSK, Bleek CBS Mayhem, Fuct AL LGF, Jeloe US BKF CF, Naut One, Pharoe LCF SOB, Pysa MSK LTS, and Silencer. For those people who would truly appreciate seeing these artists, I think the content in this book would be better published in the form of a regularly-updated blog. Works on a billboard are typically short lived, so the book can show recent and past works by artists but can’t update readers on how long the pieces lasted which is one of the interesting part of ad disruptions. 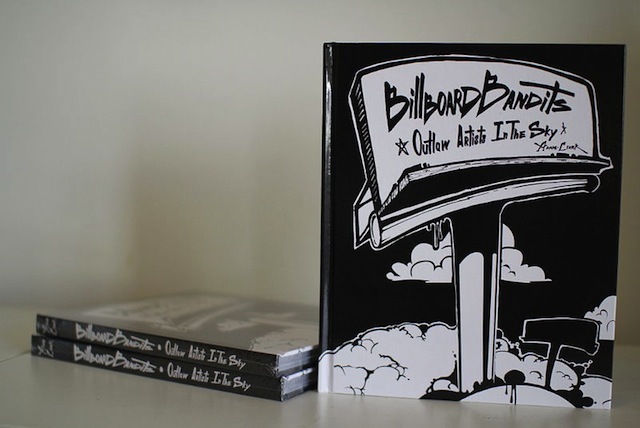 You can get a copy of Billboard Bandits here. 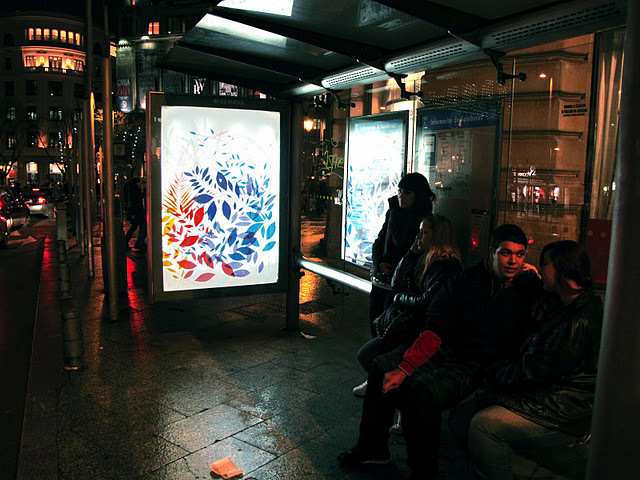 In 10 hours, artist Vermibus removed 30 advertisements from the streets of Berlin. The anti-consumerism project is as straight forward as its name: NO-AD. 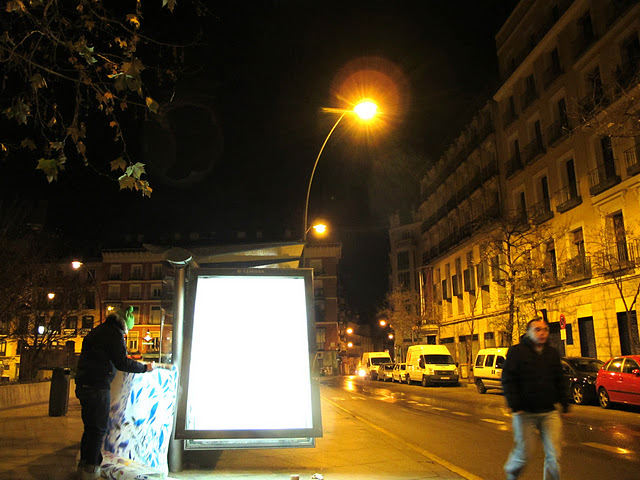 Yesterday we posted about Rosh’s ad disruption in Madrid. 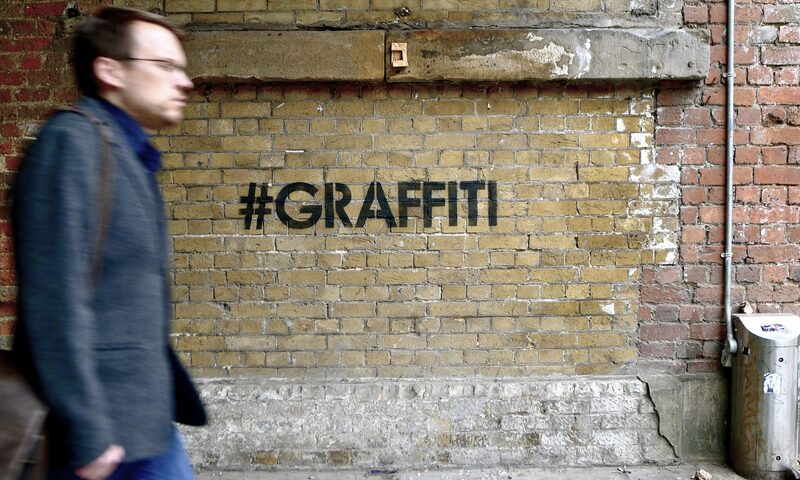 Personally, I think that these are a part of one of the more important movements in street art. For a lot of ad disruptors, facing the physical obstacles is just a regular part of the game. 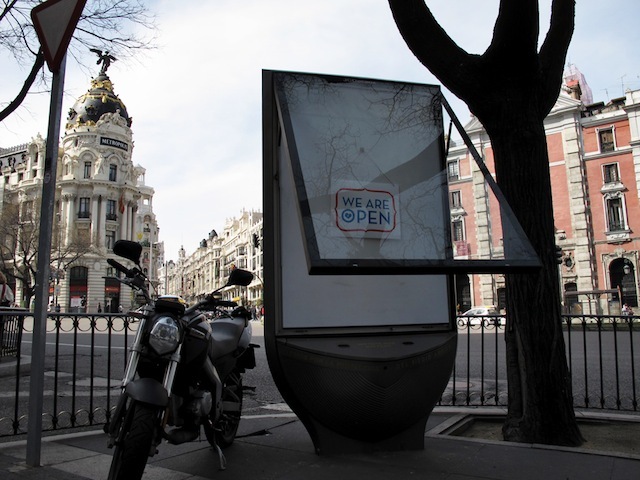 Rosh has leveled the playing field between advertisers, ad disruptors and any old pedestrian in Madrid. The open invitation may provoke passersby to manipulate their environment, or provoke them to consider their decision not to. Either way, it is simple yet powerful work by Rosh. 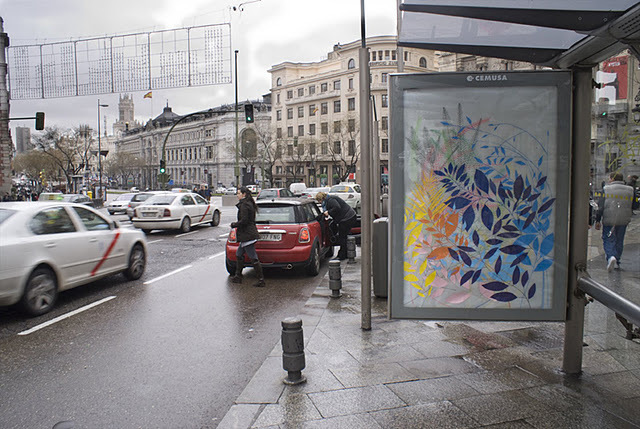 Last August Spanish artist Nuria Mora put up some work in the advertisement panels of a few bus stops. Here’s one of the series.